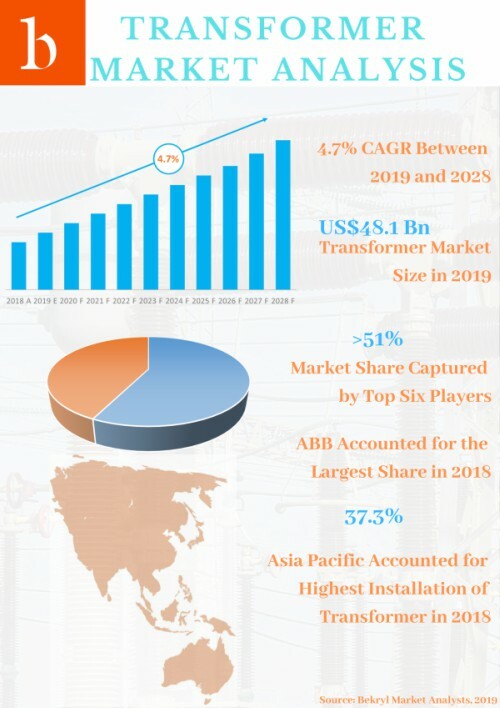 Global Transformer Market Size is estimated to be valued over USD 48.1 billion in 2019 and will register a CAGR of 4.7% during the forecast period 2019-2028. Transformer transfers electrical energy from one circuit to another by electromagnetic induction. The industry demand is increasing as a result of capacity addition and higher product replacement rate. As of 2018, the industry is substantially consolidated with top six players accounting for over 51% market share. ABB accounted for the largest transformer market share in 2018. These companies are emphasizing on product innovation and long term engagement with government bodies in order to stay agile. Merger and acquisition has also become critical to go-to-market strategy. Another trend witnessed is system digitization to improve output efficiency. One such initiative was noticed in 2018 wherein ABB launched the world’s first digitally integrated power transformer in Germany. Also, a series of merger acquisition took place in last few years, showcasing aggressive marketing approach to generate higher ROI during the forecast period. In 2018, ABB acquired GE Industrial Solutions. This will help ABB to distribute dry type transformers in U.S. In 2017, Enel announced the acquisition of Celg Distribuição S.A. – a power distribution company that operates in Brazil. Acquisition will help Enel to capture growing market in Brazil. Overall, the transformers are manufactured by leading players having production unit located in specified areas. They export to various regions either through own distribution networks or third party suppliers. Each transformer has its own specifications and varies according to the project demand. As such, costs incurred increases over time. Various geopolitical agreement and macroeconomic factors is also expected to create favorable demand. For instance, cross border power system installation will create significant demand for power transformers. Demand for transformer is expected to rise due to higher influx of renewable energy and installation of upgraded equipment. The demand will continue to increase however, at relatively slower speed. Currently, many companies are running at 75%-80% capacity, which is lower than industry standard of 85%-90%. Delay in infrastructure projects has mostly impacted the installation. This will increase in period of time, with speedy infra-energy projects. At the same time, it will create high revenue opportunity to industry players. In 2018, power transformers dominated the global transformer market share. Over 21 thousand power transformers were installed in 2018. This segment is substantially consolidated with limited number of players. Asia Pacific is the most lucrative region driving the overall demand for power transformers. Rising population and economic growth has created favorable business environment for players. On the other hand, distribution transformer is slightly fragmented. Low entry barriers in the distribution transformer market have led to entry of many unorganized players that compete on price. In 2018, majority of transformer were installed across residential and commercial places followed by industrial sector. Together, these end-use is estimated to account for 73.3% market share in 2019. Real estate is registering impressive growth post economic recession. Various government are taking concrete steps to boost construction. Smart city is one such concept, making all-rounds worldwide. Recently, the government of India proposed 100 new smart cities at a cost of US$ 2 Trillion. Advancement in the project will bring new revenue opportunity for allied industries including transformer manufacturers. Transformers with 61 to 600 MVA accounted for over 48% share in 2018. These are primarily used for industrial purpose and are integrated with large scale transmission lines. Rapid urbanization across developed economies accompanied by mass migration across urban areas positively influence the product penetration. Oil insulated transformer is estimated to hold largest share in 2019. Oil insulated transformer are highly durable and reliable for large transformer. These are primarily deployed for 138 to 765 kV transformer. Pad mounting based transformer is estimated to account for over 42% market share in 2019. These are oil filled units and are primarily used in outdoor installation. It is ideal for medium sized transformers of upto 40kV. Rapid industrialization and urbanization are key factors driving the overall sales of pad mounted transformers. 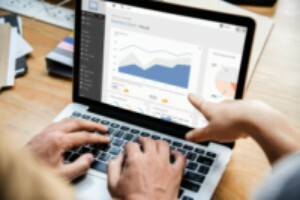 Asia Pacific is estimated to account for over 37.3% share in 2019. Moreover, it will gain over 420 basis points to create substantially higher revenue opportunity for industry players. China, India and Japan collectively accounted for 84% regional share in 2018. However, ASEAN is also registering impressive growth. While some markets in Southeast Asia are experiencing slow growth, rising urbanization in Vietnam, Indonesia and Myanmar are keeping the transformer market afloat. Overall, China will dominate the transformer installation in Asia Pacific. China has dedicated special plans to enhance the inter-connected grid capacity in 11th and 12th five year plan. Regional players have substantially good market position in the country. An in-depth analysis of the Transformer market across regions – North America, Latin America, Western Europe, Central and Eastern Europe, Asia Pacific, Middle East, and Africa. How the Transformer market sales is expected to grow throughout the forecast period. To access the detailed Transformer industry TOC and sample research pages, download sample. In order to prepare historical data and analyze Transformer market forecast, Bekryl prepare data for product supply and actual demand from end-use consumers. Through this, we get to know actual demand for Transformer market globally. The data collection is done through secondary and primary market research and then a constructive model is developed. With the model constructed, the cluttered data collected through different sources is structured with the help of proprietary analytical tools – making us understand the variation happened in the current year compared to historical years. To forecast Transformer industry revenue, Bekryl Market Analysts takes in consideration the demand growth of the segments. Demand for the product is dependent on end-user spending which is a function of many factors: amongst them macroeconomic strength, price variation and other base factors. The forecast methodology requires extensive data analysis across countries. Among all the factors, GVA and GDP output is considered as the first set of approximation. Bekryl Market Analysts has developed a demand driven model based on GDP across targeted countries. Under this, co-relation is analyzed between product and GDP – resulting in a constant GDP-Product coefficient. Higher the coefficient- greater will be the growth rate. For instance, GDP-Product segment coefficient matrix of 3 denotes Transformer industry growth is nearly 3.5X to 5.5X higher than the relative GDP.